Dr. May has 20 years of experience working with children and adults with intellectual and developmental disabilities, school-aged children with severe challenging behavior (including school personnel and parent training), and adults with acquired brain injury across a variety of settings. His research has included translational and applied research with animal and human populations. Dr. May has contributed to three edited books and has been published in several peer-reviewed journals such as the Journal of the Experimental Analysis of Behavior, American Journal of Intellectual and Developmental Disabilities, Intellectual and Developmental Disabilities, Research in Developmental Disabilities, Education and Treatment of Children, Behavioral Brain Research, Physiology and Behavior, and Brain Research. Before coming to The Chicago School, Dr. May was an Associate Professor in Special Education, an affiliated faculty member in the Behavior Analysis and Therapy program, and Department Chair at Southern Illinois University Carbondale. 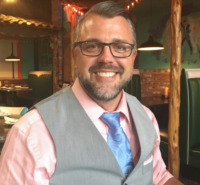 He served as the clinical coordinator of the Vanderbilt Behavior Analysis Clinic coordinating behavior-analytic, psychiatric, and medical interventions for young adults with intellectual and mental health diagnoses transitioning from mental health and developmental institutions. Dr. May is currently an Associate Editor for the journal Education and Treatment of Children, and serves as a reviewer for several peer-reviewed journals. May, M. E., Shayter, A. M., Scmick, A., Barron, B., Doherty, M., & Johnson, M. (2018). Teaching preschool children to identify and report suspicious packages to adults.. Journal of Applied Behavior Analysis, 51 , 571-589. May, M.E. (2018). Effects of differential consequences on choice-making in students at risk for academic failure. Behavior Analysis in Practice, , in press. May, M. E., & Korb-Schlenker, R. (2018). Choice as an establishing operation for on- task behavior in students at risk for academic failure. Journal of Applied Behavior Analysis, , Under Review. Chitiyo, J. & May, M. E. (2018). Factors that may hinder the implementation of the school-wide positive behavior intervention support model. Journal of the American Academy of Special Education Professionals, , 35-47. Chitiyo, J. & May, M. E. (2017). Factors predicting sustained implementation of the school-wide positive behavior intervention support model. Preventing School Failure., 62 (2), 1-11. May, M. E., Chitiyo, J., Goodin, T., Mausey, A., & Swan-Gravatt, C. (2017). A Service Learning Model for Special Education Teacher Preparation in Secondary Transition Programming. Career Development and Transition for Exceptional Individuals, https://doi.org/10.1177/2165143417716885 , 1-10. Headrick, T.C., & May, M. E. (2017). A derivation of the exponential distribution through an infinite sine series.. Applied Mathematical Sciences, 11 , 2023-2030. May, M. E. & Sheng, Y. & Chitiyo, M. & Brandt, R. C. & Howe, A. P. (2014). (2014). Internal Consistency and Inter-Rater Reliability of the Questions About Behavioral Function (QABF) Rating Scale When Used by Teachers and Paraprofessionals.. Education and Treatment of Children, 37 , 347-364. May, M. E., & Howe, A. P. (2013). Evaluating competing reinforcement contingencies on the off-task behavior of a preschooler with intellectual disabilities.. Education and Treatment of Children, 36 , 97-109. Juarez, P., Valdovinos, M., May, M. E., Lloyd, B., Couppis, M., & Kennedy, C. (2013). Serotonin2A/C Receptors Mediate the Aggressive Phenotype of TLX Gene Knockout Mice.. Behavioural Brain Research, 256 , 354-361. May, M. E., Brandt, R. C., & Bohannan, J. B. (2012). Moderating effects of autism on parental attitudes toward genetic screening for aggression.. Intellectual and Developmental Disabilities, 50 , 415-425. Chitiyo, M., May, M. E., & Chitiyo, G. (2012). An assessment of the evidence-base for school-wide positive behavior support.. Education and Treatment of Children, 35 , 1-24. Paliwat, M., & May, M. E. (2012). The impact of cultural diversity on special education provision.. Journal of the International Association for Special Education, 13 , 56- 61. May, M. E. (2011). Aggression as positive reinforcement in people with intellectual disabilities.. Research in Developmental Disabilities, 32 , 2214-2224. May, M. E., Lightfoot, D. A., Srour, A., Kowalchuk, R. K., & Kennedy, C. H. (2010). Association between serotonin transporter polymorphisms and problem behavior in adult males with intellectual disabilities. Brain Research, 1357 , 97-103. May, M. E., & Kennedy, C. H. (2010). Health and problem behavior among people with intellectual disabilities.. Behavior Analysis in Practice, 4 , 1-9. Harvey, M. T., Kline, R. H., May, M. E., Roberts, A. C., Valdovinos, M. G., Wiley, R. G., & Kennedy, C. H. (2010). Parametric analysis of thermal preference following REM sleep deprivation in the rat.. Neuroscience Letters, 485 , 98-101. May, M. E., & Kennedy, C. H. (2009). Aggression as positive reinforcement in mice under various time and ratio reinforcement schedules.. Journal of the Experimental Analysis of Behavior, 91 , 185-196. May, M. E., Srour, A., Hedges, L. K., Lightfoot, D. A., Phillips, J. A., Blakely, R. D., et al. (2009). Monoamine oxidase A promoter gene associated with problem behavior in adults with intellectual/developmental disabilities.. American Journal on Intellectual and Developmental Disabilities, 114 , 269-273.